Black Moor is unique in the sense that it can be easily recognized by its solid black velvety color. It is sometimes referred to as the black version of the telescope goldfish because of its protruding eyes. However, it does not protrude as far compared to the other normal telescopes. The fins are generally thick and the body is very stout and deep. This variety of goldfish is considered hardy and will tolerate changes in water temperature easily as long as it is not in the extremes. Thus the goldfish is highly recommended especially for beginners. Similar like other goldfish varieties, black moor has a very hearty appetite and will gobble up almost anything that you feed to them. They are not selective and picky when it comes to food and will readily accept fish food pellets, flakes, live foods, cucumbers and peas. However, due to their poor eyesight, they usually have difficulty finding their food and as such, they should not be mixed with other goldfish varieties that are fast and agile like common goldfish, shubunkin and fantail. 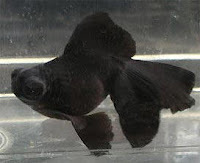 Black moor are not born black. The young moors are actually colorless and will then slowly turn into bronze before coming to their all-black velvety appearance. Most black moors will retain the color until old age while some will slowly revert to orange color as it grows old. Believe me, I’ve seen before a young black moor raised up to become an orange adult telescope goldfish and many people do not realize that this is actually true.